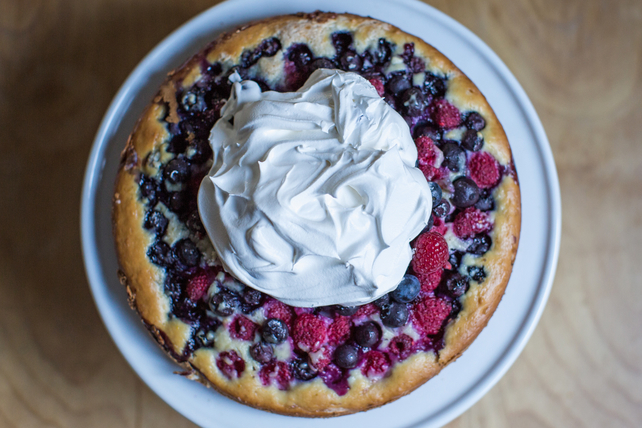 Fresh berries make this our best spring showstopper dessert. Beat cream cheese product and 1/3 cup brown sugar replacement in large bowl with mixer until well blended. Add egg whites and zest; mix well. Mix 1 cup flour and baking soda. Add to cream cheese mixture alternately with sour cream, beating just until blended after each addition. Spread onto bottom and 1 inch up side of 9-inch springform pan sprayed with cooking spray. Combine 1 cup berries, remaining brown sugar replacement and flour; spoon over cream cheese mixture in pan to within 1/2 inch of edge. Bake 35 to 40 min. or until toothpick inserted in centre comes out clean. Run knife around rim of pan to loosen cake; cool before removing rim. Spoon remaining berries over cake. Serve topped with Cool Whip. Refrigerate leftovers. Seasonal berries make this dessert irresistible. Use whatever fresh berries are available. Dust cake with icing sugar for an elegant touch. This colourful dessert can be part of a healthful eating plan.